Being Scottish I love potatoes or tatties as they are called in the home country. Roasted, mashed, fried, golden croquettes...any which way I love them. Who can go past hot chips sprinkled with a good pinch of salt? You’ve got to have salt. And for me a splash of vinegar goes down a treat too. All golden crunchy on the outside, warm & fluffy on the inside they are just too tempting to resist. 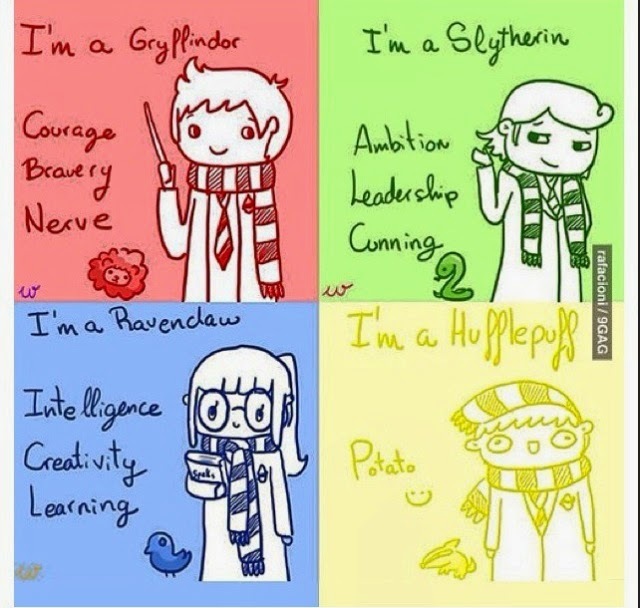 This picture always make me laugh...I think I’d definitely be a Hufflepuff! At home Dad used to make tattie scones with left over potatoes on Sunday afternoons, potato mashed up & rolled out & then fried in a little butter. Too impatient to wait we’d eat them straight from the pan slathered in more butter & rolled up. The butter melting & dripping down your fingers & chin. These ones here are a little more grown up, flecked with dill & topped with smoked salmon & a little dollop of creme fraiche. Place the creme fraiche in a small bowl & add the lemon juice, dill & season with salt & pepper. Taste & add more salt, pepper or lemon juice if needed. Cover & set aside in the fridge until ready to serve. For the tattie scones; cut the potatoes into 2.5cm pieces & cook them in a pot of salted boiling salted water for about 7 minutes, or until fork tender. Drain them & allow them to cool a little before returning them to the empty pot & adding the flour & baking powder. Mash the potatoes & add the dill & the butter. Mash a few more times to mix everything together & season with salt & pepper. Taste & adjust seasoning if need be. Place a sheet of baking paper on a board & add half the potato mixture, top with another sheet of baking paper & roll the potato mixture out to about a 1/2 cm thickness. Cut out small bite sized rounds, use a small glass or the lid of a small jar. Put a large frying pan on over a medium heat & add a drizzle of olive oil. Add the little tattie scones in batches & cook for a few minutes each side until golden. Place on kitchen paper to remove any excess oil & then place them in a baking dish & pop them in a warm oven to keep them warm while you cook up the rest of the tat tie scones. To assemble place the tattie scones on a platter, top with a little smoked salmon & little of the creme fraiche mixture. Finish off with a few fronds of dill & serve immediately. **Thanks Regal for the Artisan Salmon. Beautiful New Zealand King Salmon is cured with sea salt & smoked with manuka wood chips. Melt in your mouth delicious New Zealand Salmon. It was a sunny Sunday & a friend over for lunch & I am very glad we made the most of that sunny afternoon; that I think everyone thought was just another sunny day in what appeared to be an endless Summer. Well Thursday’s weather put paid to that theory. With no warning whatsoever we woke to gale force winds, torrential rain, toppled trees, roads flooded & power cuts! We’d been hit by the tale end of cyclone Eta, she was certainly a fierce one & I am thankful we only caught the tail end! Lamb Kofta Mezze, adapted just a little from Jamie’s 15 Minute Meals, plus a few additions. *Pre-heat oven to 180C/350F. Peel 2 medium beetroot & cut in 2 wedges. Place on a baking tray & drizzle with a little olive oil & season with salt & pepper. Roast for 25-30 minutes until tender. Leave to cool & then place them in the bowl of a food processor & add the juice of 1 lemon, 1 garlic clove, 1 teaspoon each ground cumin & ground coriander, a pinch of cayenne & a bunch of mint leaves. Add a third of a cup of natural yoghurt, blitz & season to taste. Place the mince in a large bowl, add the garam masala & cayenne pepper & season with salt & pepper. Mix it all together by giving it a good squish with your hands & then shape in to little fat fingers. Heat the olive oil in a large frying pan over a medium heat & add the koftas, turning them until golden all over & cooked through. About....... Drain the fat from the lamb& toss with the smashed pistachios & honey. Place on a platter with lemon wedges to serve. For the couscous, place it in to a medium sized bowl & add 2 cups of boiling water & leave it to sit for 10-15 minutes. Once the couscous has absorbed all the water fluff it up with a fork & add the mint, chilli & preserved lemon. Season with salt & pepper, drizzle over a little olive oil & mix well. Place in serving bowl. Place the lettuce on a serving platter & scatter over the tomatoes & olives. Peel & coarsely grate the onion & cucumber in to a bowl & add a pinch of salt. Squidge it all together to get rid of any excess water & scatter that over the salad too. Mix the yoghurt with the lemon juice & season with salt & pepper & drizzle it over the salad. Finally crumble the feta over the top. Serve it all with warm pita, beetroot dip, hummus & some pickled onions. Warm pita, smeared with a little hummus or beetroot dip, a little salad, a little kofta topped with a little pickle makes for a tasty bite, especially when eaten in some late summer sunshine. I was in the mood for a bowl of soul food, so soup it had to be. "Do you have a kinder, more adaptable friend in the food world than soup? Who soothes you when you are ill? Who refuses to leave you when you are impoverished and stretches its resources to give a hearty sustenance and cheer? Who warms you in the winter and cools you in the summer? Yet who also is capable of doing honor to your richest table and impressing your most demanding guests? Soup does its loyal best, no matter what undignified conditions are imposed upon it. You don't catch steak hanging around when you're poor and sick, do you?" I’ve never made pho, that classic Vietnamese soup, before but I couldn’t resist the savoury broth simmered for hours, poured over noodles, topped with chicken & then a myriad of condiments to make each mouthful a little adventure all of it’s own. It’s comfort food at it’s best, uplifting for body & mind but bright, fresh & fragrant to awaken the taste buds. This one is all about the broth. If you are in a hurry you could use a good bought stock & add some spices but if you do have time make it from scratch as the depth of flavour delivered will beat any ready made stock, plus it’s not hard you just need to leave it simmering away on the stove to work its magic for a while. I promise this one is most definitely worth the time. Place the onions & ginger on a lightly oiled baking tray & roast in the oven for 30 minutes or until softened & lightly browned. Fill a large pot with the water & bring it to a boil. Add the roasted onions & ginger, the chicken, salt, sugar, star anise, cinnamon stick & coriander & bring to a boil. Lower the heat to moderate & simmer until the chicken is cooked through, about 30 minutes. Remove the chicken from the broth & using tongs, transfer it to a plate & let cool slightly. Remove the meat from the bones & pop it in the fridge. Return the skin & bones to the pot & simmer for a further 2 hours until reduced to about 6 cups. Stir in the fish sauce & adjust to taste. I love fish sauce so I always like an extra little splash. Cook according to the packet instructions. Drain well & divide the noodles between the bowls. *Cook the noodles in this separate pot of water to avoid clouding your beautiful broth. To serve add the reserved chicken to the broth & simmer until heated through. Ladle the broth & chicken over the noodles. Serve with the bean sprouts, spring onion, herbs, lime wedges, chillies, sriracha, hoisin sauce & crispy shallots. Oh my this is quite the soup. Comforting, nourishing & that broth so much flavour. Savoury from the chicken, a little sweet from the star anise & the cinnamon & that delightfully sour note from the fish sauce. To eat top each spoonful with a mixture of toppings rather than putting everything in to the soup. This way the herbs stay bright & fresh, the bean sprouts & spring onions nice & crunchy & you can mix up each mouthful you have. Perhaps a little hoisin, a little chilli & a sprinkle of crispy shallots or bean sprouts, coriander & sriracha it is entirely up to you. However each mouthful will be a little flavour journey all of its own. Fancy a little trip to South America? Short of actually going there you should check out Maldito Mendez. The first visit was an early dinner after work one Tuesday, so no problem securing a table in the little courtyard just outside. It was a balmy summer evening & we were in the mood for some bubbles so a bottle of refreshing cava was the tipple of choice for the evening. To start some tortilla chips with guacamole, salsa & sour cream to tide us over until everyone arrived. Great guacamole & bright fresh salsa, we would just have like a little more. We shared a few dishes for the main event. On the salad front it was a black bean, mango salad with chilli lime & coriander that was bright & zingy & just a nice hit of chilli heat. The crispy coconut chicken tacos were also a tasty treat, juicy & tender chicken with a golden crispy coating topped with chipotle may & on a fresh bed of spicy cabbage slaw with tamarind & pineapple for a little fresh & a little crunch. However, the star of the show was the Manuka smoked rib eye with the mandioca chips & the classic Argentinian chimichurri sauce with parsley, garlic, oregano, olive oil & wine vinegar. The mandioca chips were crisp & golden & ever so moreish & the chimichurri was sharp & tangy, perfect with the rib eye. We did order dessert, 2 dessert! But our eyes were definitely bigger than our bellies! We couldn’t quite finish the churros, even though they were light & quite heavenly dunked in the spiced hot chocolate. Our Argentinian diner couldn’t go past the alfjor, an Argentinian dulce du leche cookie. The verdict; good but it needed more dulce du leche. Then again it’s probable that we’d always like more dulce du leche. For my next visit it was lunch & a hibiscus tea to sip on which was sweet but not too sweet & a refreshing & zesty tipple on a hot sunny day. The black bean mango salad with chilli lime & coriander made an encore appearance & was just as good the second time round. On the taco side of things it was fish this time & they were so good! Lightly crumbed perfectly cooked fish trumped the crispy coconut chicken tacos. What made the even better was the addition of pomegranate & tomatillo for a little burst of tart & tang. On any future visits it will be hard to go past these little beauties. Another standout was the lamb birria, an ever so flavourful lamb stew with roasted red peppers served with red rice, flour tortilla, sour cream & pickled red onions. No dessert this time but another delicious meal at Maldito Mendez. It’s a friendly little joint & I will definitely be back for more.